We have opportunities to learn about the communities where we operate through initiatives of dialogue and relationship so that we are able to manage the real and potential impacts of our work. Veja como compartilhamos no programa O que tem aqui as riquezas, culturas, curiosidades, belezas naturais e desafios enfrentados pelas comunidades em que atuamos. Positive influences on the territory through the supply chain is also evaluated and monitored, following the standards of conduct established. Learn more on Sustainability in the production chain. 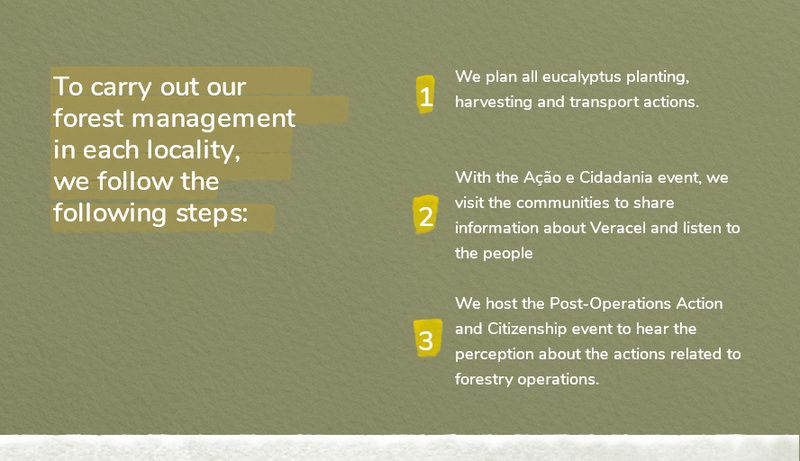 The Ação e Cidadania program was established in March 2012 to strengthen the communication channels among the company and the communities where it operates. 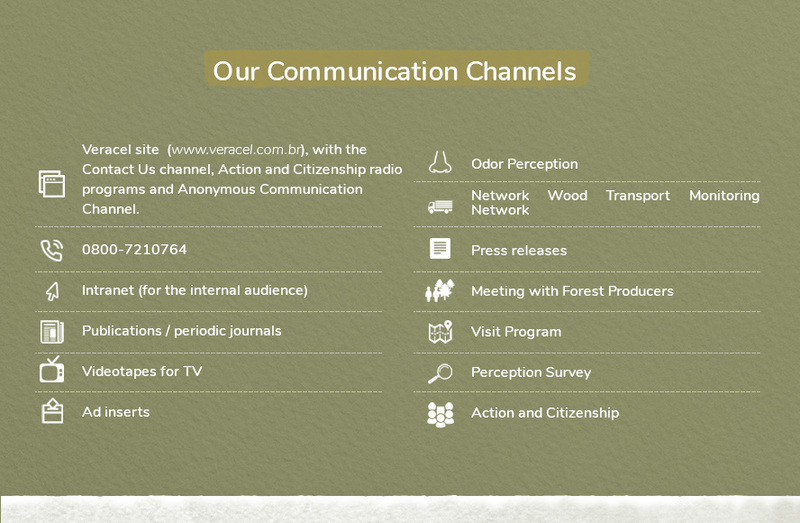 These activities haves been so successful that, besides meeting a requirement of the Operation License for forest activities – which requires the company to submit its operations before starting the activities – the initiative has already proved to be an important forum for dialogue where transparency and accountability prevail. During these meetings, we present out potential footprint, learn about the communities’ concerns, clarify questions and discuss the mitigation actions and make our communication channels available as well. These opportunities help us improve our array of impacts, since the residents provide us with important information about the territorial dynamics. The successful program, carried out with the Mãe Terra Institute’s support, resulted in the unfolding of the actions as engagement opportunities for various topics to be developed with communities. We have thematic editions such as Environmental Action and Citizenship, which addresses issues related to the environment, and Ação e Cidadania at Maritime Terminal, held in communities near the Belmonte Maritime Terminal to address safety of transport and maritime operations at these locations. 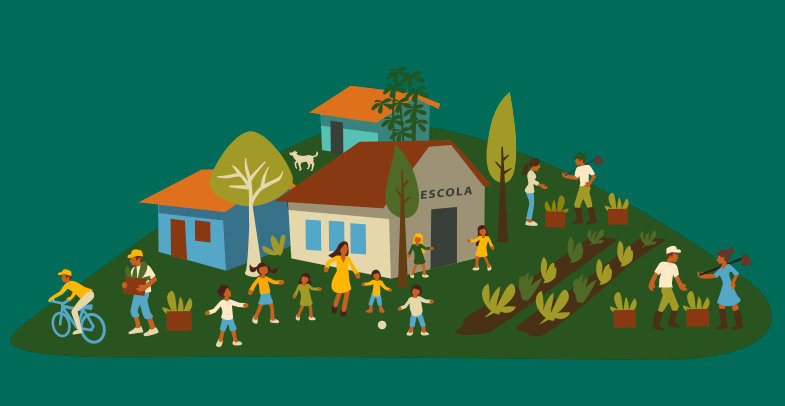 We also broadcast the Ação e Cidadania program on local radios, addressing diverse subjects of interest to the population, such as fight against the child labor, prevention of yellow fever, safety tips and trivia about the communities and their traditions. 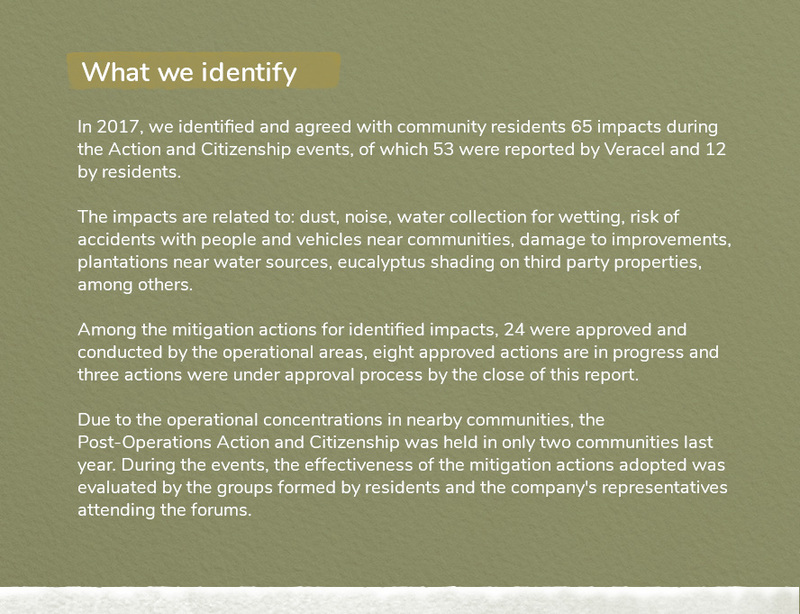 In addition to the impacts mentioned in the Ação e Cidadania events in 2017, we received 22 statements from communities related to our footprint through contacts in the various communication channels. They are complaints related to dust caused by the traffic of machines and vehicles; risks caused by trucks at high speed; risks of accidents involving fall of trees on homes due to nearby plantations; risks of damage to improvements (fences, houses, power network and others); river silting, among others. The complaint handling includes mitigating or prevention measures, such as road wetting, driver guidance and other adjustments in activities when applicable, in addition to clarifications and other actions when the risks and impacts are not related to our operations. 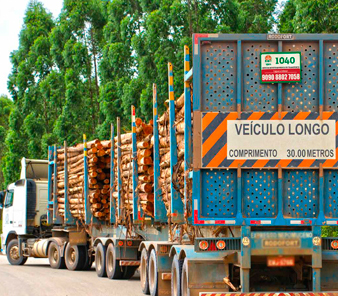 In addition to awareness campaigns on safe driving for our drivers transporting wood, in accordance with the Veracel Code of Conduct and best practices, we make a toll-free line available to communities so they can notify us about any occurrence in the wood transport. The channel is open to criticism, compliments or suggestions about the drivers’ behavior when driving our vehicles. In 2017, we received seven calls through this channel, and 100% were solved. We have provided the toll-free line since 2016 to strengthen the company’s contact with the stakeholders and the compliance. It is available in the 24*7 format and can be used by anyone to make complaints about discrimination, labor issues, employee misconduct, noise, dust, among other subjects. The call can be anonymous, and the channel is managed by an external and independent service provider, following the international information security standards.